With Justice Ruth Bader Ginsburg battling cancer for the second time in several years, thoughts naturally go to the possibility of her leaving the Court. More than that, what would the Court be losing if she left? What has her record been? How has she sided on the issues? Which Justices has she been aligned with? Which Justices has she opposed? How frequently has she been on the winning side? How often has she taken issue with the majority? In short, how has she been voting, and where does it place her within the Court? In this post, the first of 2 parts (or maybe 3), we'll look at Ginsburg's record in these "defining decisions." Her record is pretty clear. Where she stands on the issues and where she fits within the Court is pretty straightforward. 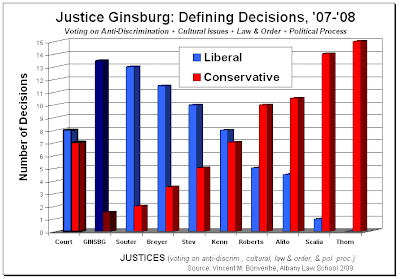 First, on the 15 "defining decisions" as a whole, the following graph depicts her "liberal/conservative" voting record, and her position within the Court's ideological spectrum. 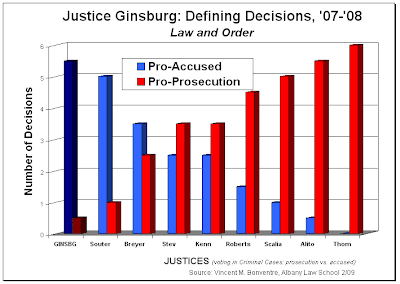 Specifically, it depicts the frequency--in terms of percentage of the 15 cases--in which Ginsburg and each of her colleagues voted for the liberal and conservative positions respectively. 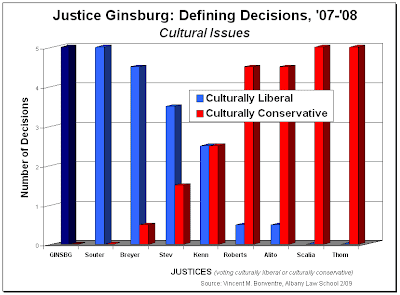 In the "cultural issues" cases, Ginsburg's record was similarly 100% liberal. Whether guns, the death penalty, Gitmo detainees or the other issues which the Court confronted in these 5 "defining decisions," Ginsburg took the position favored by political liberals each time. In the "law and "order" cases, Ginsburg again had the Court's most liberal voting record. There were 6 cases in this category: 1 was also an anti-discrimination case (race-based jury selection), 2 were also "cultural issues" cases (death penalty cases), and 3 were exclusive to law and order. 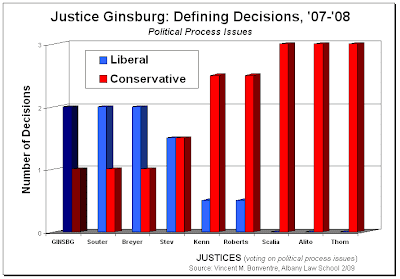 In the 3 "political process" cases (campaign spending, judicial selection, and voter ID), Ginsburg shared the Court's most liberal record with Souter and Breyer. In 2 of those cases (campaign spending and voter ID), she voted for the politically liberal position. Now let's add up all the cases--all the "defining decisions." Here's how Ginsburg's cumulative voting record in the 15 cases looks, and how her record contrasts with that of her colleagues and the Court's decisional record. 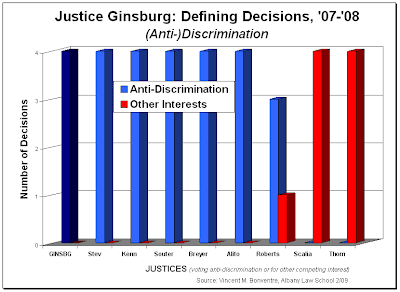 Voting Record in 15 "Defining Decisions"
Again--hopefully the repetition has not become ad nauseam--Ginsburg's voting record is the most liberal on the Court. It is not as liberal as Thomas's or Scalia's are conservative. But like those two, her record places her at one end of the Court's ideological spectrum. 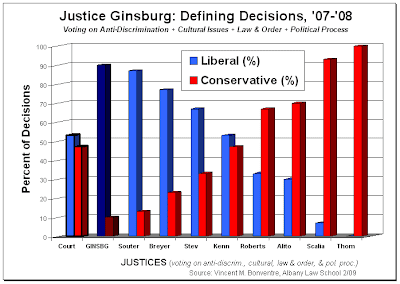 As her voting in the 15 "defining decisions" cases strongly suggests--both in total and in the 4 individual categories of cases--she has simply been the most consistent liberal on the Court. If Ginsburg's medical condition should cause her to leave the Court [Every decent human being, of course, hopes that she recuperates fully and does well for a long long time. ], it will have lost its most reliable liberal vote. It's most consistent vote on the opposite side of the Court's political spectrum from Thomas and Scalia--as well as their frequent allies, Roberts and Alito. The vote most often taking issue with the Court's generally politically conservative jurisprudence. So nothing is a sure bet. But one thing is pretty sure. Ginsburg has a track record. It's liberal. There is no indication she is changing. Indeed, there is every indication that her voting is pretty liberal across the board and can be counted on to be so in most "hot button," controversial, ideologically and politically charged cases. That may be a good or bad thing depending on the beholder's own ideological and political perspective. But as long as Ginsburg remains on the Court, it is a pretty clear and reliable thing. In the next post, we'll look at Ginsburg's voting alignments among the Justices and her frequency in the Court's majority and dissent.